Shopping Guide For Single Mothers - Shopping Tips! Shopping Guide For Single Mothers – Shopping Tips! Single mothers are like the superwomen in the child’s life they have the beauty of managing the out and in of the home. Being a mother indeed come with a lot of happiness and responsibility. One definitely knows how hard it is to deal with the young kids and giving the best out of limited resources. When it comes to a situation like shopping, running errands, cleaning when you have to do it alone then it has some challenges that you may come across. But when you are super mom you are sure that you are ready to face all this with your smile on. 15 ways you can make your shopping more exciting and fun! Managing a home you need to buy a lot of things and having a baby you have a huge care list. So you need to make out time from a busy life to go shopping for you, your baby and your home. It could be a little messy as its a lot in whole buy here is a guide which will help you sort your things and make your shopping easy to do. It’s always important mommy that you calm yourself and do not panic in the course of doing all this. Now shopping comes with an expense and being a single mother you know sometimes it can be tough with all your other expenses growing day by day as your child is growing. So we will guide to the best time that you should be picking your bags up and not crying over the huge bills. The best time you can go shopping in the sale period, now if you are concerned that how do you know about this then keep your eye on big sale coming over via the internet or you can also use the festival sale that does happen during the start of January in most of the cities. So be aware of the sales that are about to hit your place and you can definitely grab some great things at a very lower price. If you are an online person then all the big e-commerce companies have two huge sales in a year, which can actually make you get a good deal. And sometime if you are very lucky then you might get the flash sale that can be like a cherry on the cake. Now to be a smart mom this time you have to make a plan. You and your baby have different needs and some might be a genuine need and some might just be a desire, so you have to plan what all you have to shop and how important it. Your budget should be fixed so that you don’t mess up with things because of the amazing attracting things available all around. So just before you start your month sit down with a notepad and make a list. Then when you have to shop and what to do in the meantime. This will organize your things because you already have multiple things going all in your head. Planning is key to success, it will definitely make your shopping an easy task. Mothers are superheroes for sure but even they fail when it comes to the kids crying all around. So we all know shopping multiple things you need patients and with the little ones, it can be a little hard to tackle them while rushing from one corner to other. So it’s always advised to shop when your munchkin is at school or any alternative rather than carrying them with you. This will help you focus on what you wanna buy and what you should look for. Shopping just does not has needs but also need to have a smart brain as it involves money. Being at peace of mind will help you calculate your expenses well. And it will make sure you have your shopping with peace and no troubles. Like we spoke about this in the previous points also, shopping is more about expense you being a sole earner you have to make sure about what to spend and how you spend. You need to fix a budget plan and make sure you spend your money within the limit drew. There will be multiple things in the store that might attract you but you have to stick to the priorities that are needed. It is also important that you look for all the alternatives when you shop. Like same products come in different brands and different prices so you need to figure out the best from all the available options. His will help you save a lot of money and also make you happy after all the shopping. Prioritizing the list is important now, you have a huge list in your hand that has to come when you are back home from the shopping. But all are not the must and few are really important. So you have to make a list in an order where all the essentials are on the top and below that are the secondary needed things which can be looked once you are done with the important things. It will help you have a structure to all your buys and you will not forget anything that should have been must. So always know what is your priority special when you have a little one with you. So superwomen you have been in all the hosh-posh of your life in the way of being the best mom but you also need to shop your things to. You also need to give importance to the things you want. Once you are done with all your other things take a day just for buying things that you need. This will give you time to organize your things. You will be able to manage what you want. So set your time where you only shop what is required for you. Being a mom makes it tough to give yourself some time. But you are also a human and like every other person you also need some time for yourself and your needs. This is a point that is for all the mommies with the infants or too small babies, we understand it is not easy for you to step out of the house so why not use the modern technology. Now rather than going out you can just do all your shopping online and that too from multiple stores under a single platform. This will help you by doing it as per your need. You can do it easily when your baby is sleeping or by taking breaks on your daily life. It can be a true blessing for you as going out can be a little tough with young love babies. So super moms you just have your online weapons ready for you. 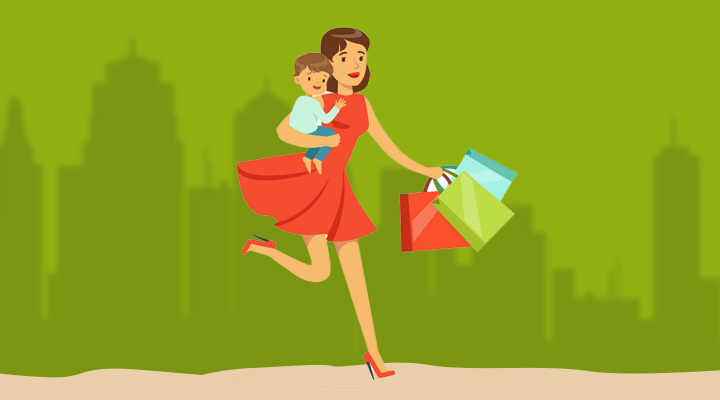 These are some amazing tips that every single mom or a parent can use to have a great shopping experience as you hold some responsibility and you don’t wanna mess them up. So always have a great time when it is you dealing with things.